And on a somewhat unconventional note… who would have ever thought that cranberries & cauliflower would be sharing a spotlight in a cake one day…? :) I mused at that for a moment and launched myself into a very long train of thought about what exactly is conventional these days anyways..? Go on Instagram and search for healthy recipes and you’ll find a million and one wholesome treats that people whip up on a daily basis out of anything under the sun. At least amidst my circle of friends on there that’s quite a natural occurrence (some crazy crafty people they are!). Anyways… I digress.. back to cauliflower in cake… it makes perfect sense. The cauliflower gives this cake a nice creamy, ice cream cake-like texture (replacing the function of cashews in many of my cakes). And if there are veggies in it, you’ve got more of an excuse to enjoy an extra slice ;) . The cranberries and cinnamon give it a nice flavor and a vibrant color, and mask any hint of cauliflower quite beautifully. And feel free to go with other berries too. Raspberries or strawberries will work great here instead of the cranberries. Rest assured, I worked hard to ascertain no cauli flavor can be detected in this treat! I threw in pumpkin seeds into the cake itself to give it a bit of extra texture and fell in love. So delicious with this flavor pairing. For the base I used them as well. I also used dried cranberries in the base, though I think next time I’m going with my usual medjool dates. They’re easier to work with and make a softer base. So I shared the medjool date version in the recipe below. If you prefer to give it a try with dried cranberries, make sure they are a bit soft and use about a ¼ cup of them in place of the few dates. 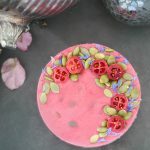 To finish things off, I sprinkled the top of the cake with extra pumpkin seeds, some halved fresh cranberries (they make pretty “flowers”, don’t they? ), and some dried cornflower petals for a burst of color. Lastly just wanted to say as you can see from the photos the cake I photographed is very small — I used my 4″ pan for the occassion. The recipe below is for a 6″ cake however as that’s a more reasonable size for most occasions and for sharing. If you wanted to make a small 4″ version just for yourself, use only a third of the ingredients listed. 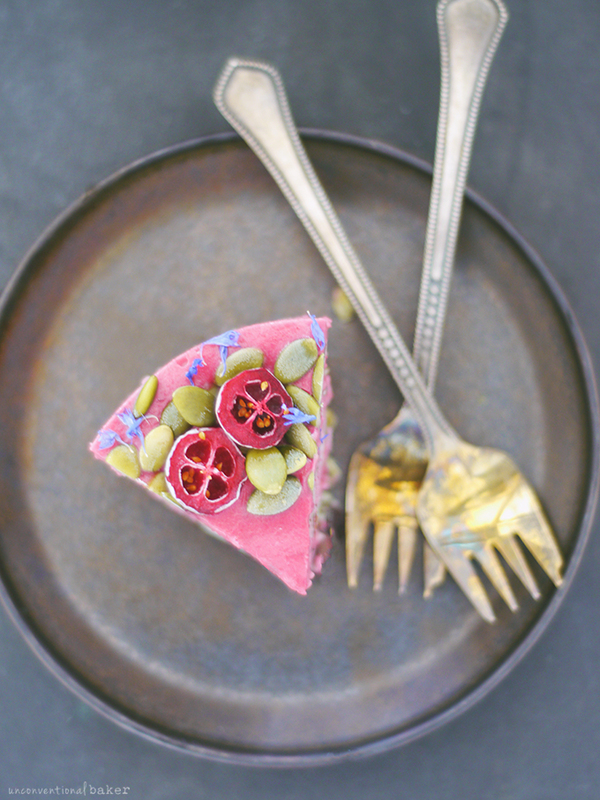 A nut-free vegan cheesecake that sneaks in a healthy dose of vegetables along with tangy cranberries. 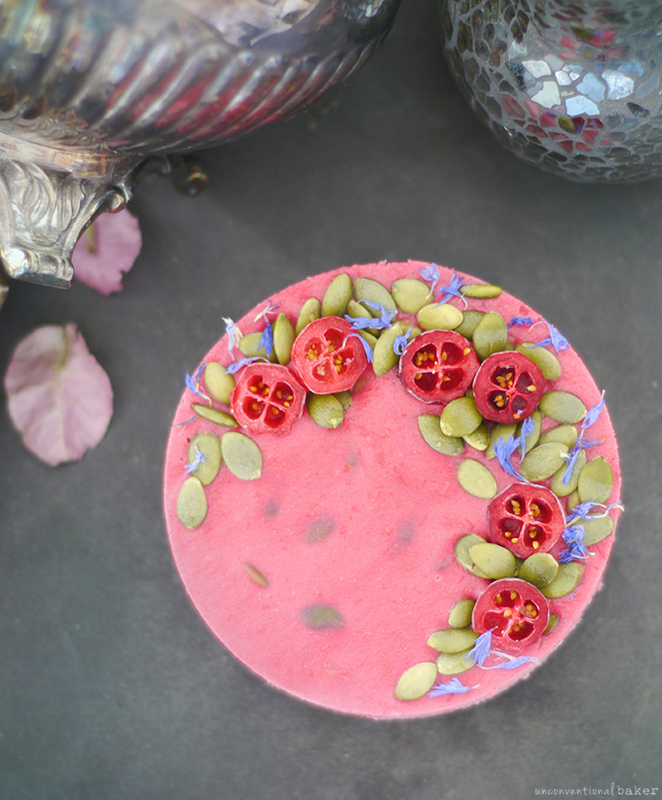 a few tbsp extra pumpkin seeds (pepitas), a few extra sliced fresh cranberries, dried cornflower petals. 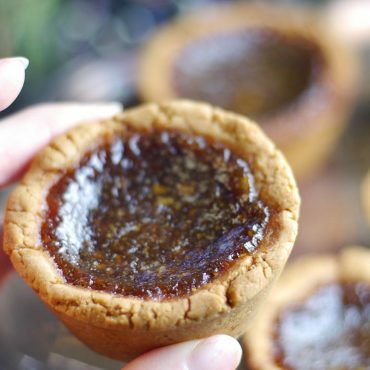 Process the pumpkin seeds, coconut oil, and dates in a food processor into a sticky crumble. Add the agave and process once again briefly to combine. Transfer this mixture into your prepared 6″ springform pan (or a parchment-lined dish of a similar size), and shape into a crust with your hands. Place the pan in the freezer while working on the next step. Ensure all filling ingredients at at room temperature before starting. Blend everything except for the pumpkin seeds into a smooth mixture. Add in the pumpkin seeds and stir to fold them in (or blend very briefly for just 1-2 seconds to mix them in without blending them down). Pour this mixture into the springform pan over the crust. Place back into the freezer for 5-10 minutes to let it chill very slightly, then decorate with any toppings. Freeze the cake for 6 hours or overnight. Keep frozen until serving time, then slice and enjoy! Freeze any leftovers straight away. Disclaimer: this post contains affiliate links to the dried cornflower petals and the 4″ springform pan I used. 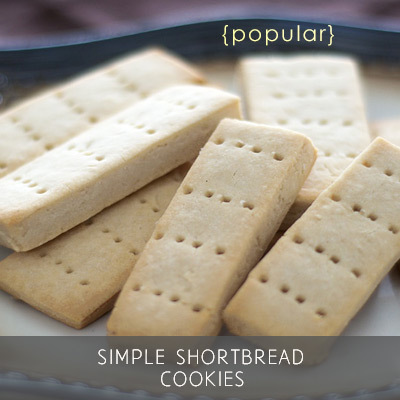 Tastes wonderfully and very easy to make. However, it took very long to thaw enough to actually cut. After waiting for half an hour, we finally decided to microwave it so it’s possible to eat using a spoon. My freezer setting is medium. I’m glad you enjoyed the cake, Lulu (despite the thawing issue). Thanks for sharing that — interesting. I find it takes about 10-15 mins to thaw out for me on the counter, but maybe it’s warmer where I am — who knows. Thank you so much Audrey for sharing your genius ideas, I would love to congratulate you for being this creative, its very inspiring!! I wanted to ask you if you have weighted a cup of cauliflower, it would be very useful to know how many grams a cup actually means, also it would be helpful to know if you measure them raw of after steaming. Again thank you very much, I’m definitely trying it!! Hi Juliana, thanks so much for your lovely comment. Thank you so so much for answering me!! I can’t wait to give it a try!! does it really have 9 tablespoons of coconut oil and 9 tablespoons of agave or maybe a typo?? seems that a slice is over 1000 calories, am I misreading it? I just ran it through an online recipe calculator and it says a slice is about 249 – 299 cal if you follow the recipe exactly (based on a 10 or 12 slices calculation, which is what I get out of a 6″ cake). Not sure where the 1000 calories came from … but def not per slice. 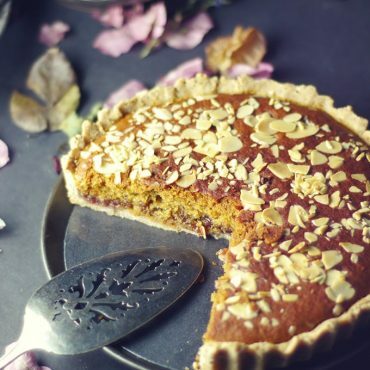 can I use pecans to sub pumpkin seeds for the crust? also, can I leave out pumpkin seeds in the filling? thanks! going to try to make it for my daughter’s birthday. You can definitely use pecans in the crust — no issue at all and it’ll be delicious. I just used pumpkin seeds to make it nut-free for those that can’t have nuts. The pumpkin seeds in the filling help to break down some of the “iciness” in the cake’s texture. You can do without them though. Or you can add finely chopped pieces of pecans too. This looks amazing! Will have to try. I did have a quick question though. 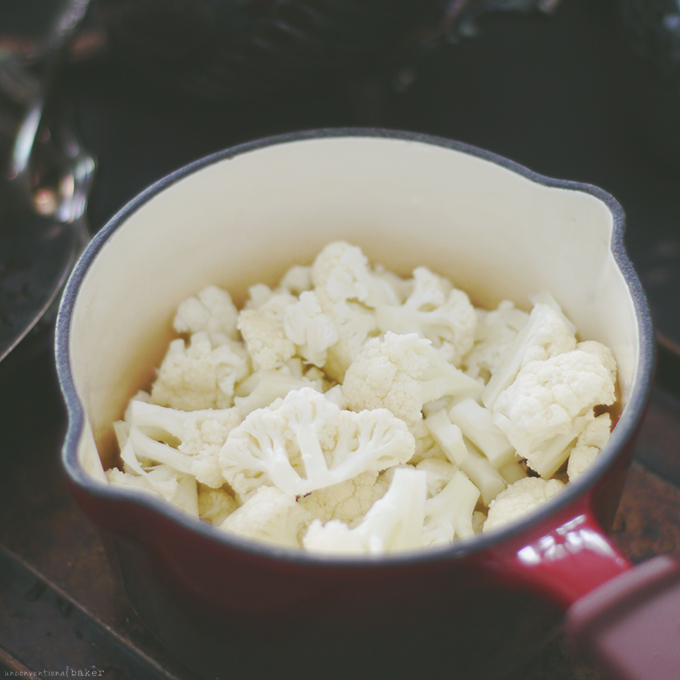 When measuring the cups of cauliflower, do you measure by florets? Or after its mashed? GORGEOUS cake Audrey! That color…and cauliflower?? WOW!! This is blowing my mind! I love this idea. I have been really into cauliflower recently, but I never thought of making it into a dessert. Genius. Can’t wait to give this a try. I’m blown away by how pretty this cake looks. I am a huge pumpkin seed lover. Will definitely be trying this. Thank you so much! I’m a huge fan of pumpkin seeds too. Hope you enjoy it! I cannot believe how beautiful this cake it, and that it has cauliflower in it!!?? Amazing! This is mind blowing, what a stunner! And why haven’t I ever cut cranberries in half like that before?? 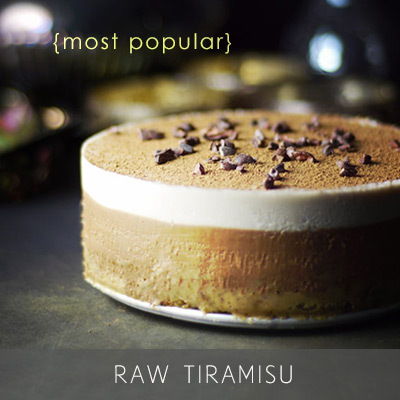 I’ve never come across a raw(ish) cake with cauliflower!! looks stunning and I bet it tastes amazing too :D I feel inspired and intrigued! Might go make one now! Wow audrey! Beautiful cake, and cauliflower? First time I’ve seen this…I know you and your work and this is probably amazing! Thanks Anjali :) You are the sweetest! 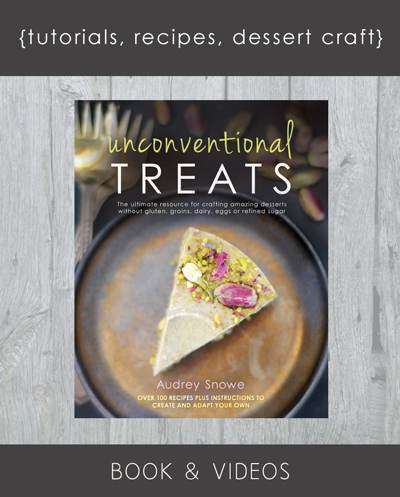 I’ve never seen a cauliflower cake, but someone mentioned something about a cauliflower treat from I Quit Sugar they’ve seen a while back — I have it on my list to look up, but maybe that’s the recipe you’re thinking of too? Ok so I’ve figured it out. 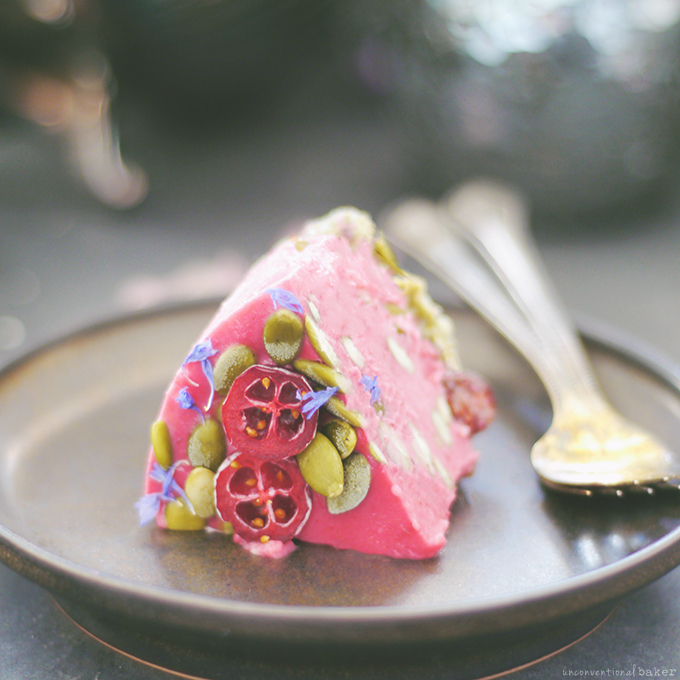 The caluliflower cake I’m talking about is actually a savoury one by Ottolenghi….hahahaha lmao at my baby brain these days. However in my defense, I do recall seeing a cauliflower dessert and it was actually brownies somewhere on Instagram. Can’t remember who posted it though. I did a quick Google search and there are a few of those. I also found the I quit sugar recipe for a cauli raspberry cheesecake. Oh you genius people. I need to start trying random veggies in desserts. Random veggies in everything — why not? 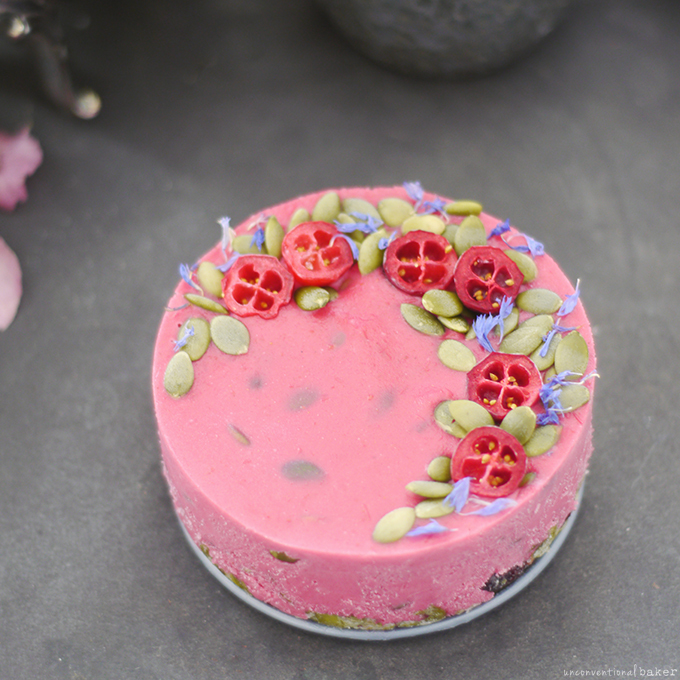 :) And wow, a cauli raspberry cheesecake?! That’s like so close. Now I MUST go find it! You had me at cauliflower, girl. I’m so making this! Oh my word, Audrey! Your book looks amazing and I can’t wait to get started! Well done! Aw, thank you Sarah! ♥ Enjoy it! Wow! 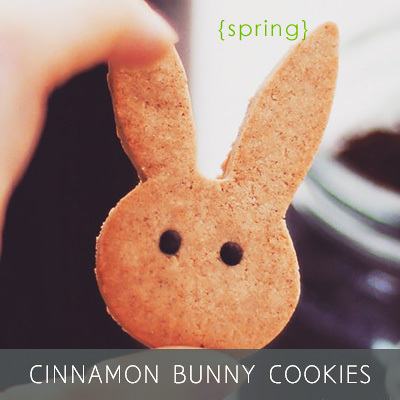 What a creative and beautiful recipe! This is such a masterful use of cauliflower. I am excited to try it soon! Thank you! Thank you so much :) I’ve been having a lot of fun with cauliflower lately and am loving how nicely it works in a cake like this. Expect a few more versions in the following weeks! It’s not the first time I hear about cauliflower in a dessert and I think it’s time for me try too! Your cake seems so delicious! This is so interesting, and love the bright colour too. I tried making chocolate fudge with cauliflower once and it was a dismal fail, but I used raw cauliflower, so am really intrigued at the likely difference using cooked! Good thing I just LOVE cauli!!! This is so fun, I’m all excited about your sweet cauliflower goodies!!! So inventive!! You’re going to make EVERYONE a veggie lover! This sounds amazing! I have no cranberries home, but will try it today with strawberries! Can’y wait! Thank you so much, Audrey! Awesome! Enjoy it ♥ Can’t wait to see what you make!